On 25 April 2015, a 7.8 magnitude earthquake struck Nepal, claiming almost 9,000 lives, destroying more than 600,000 houses, and triggering an avalanche on Mount Everest that killed 21 and made it the deadliest day on the mountain in history. A second, 7.3 magnitude earthquake on 12 May caused additional damage. 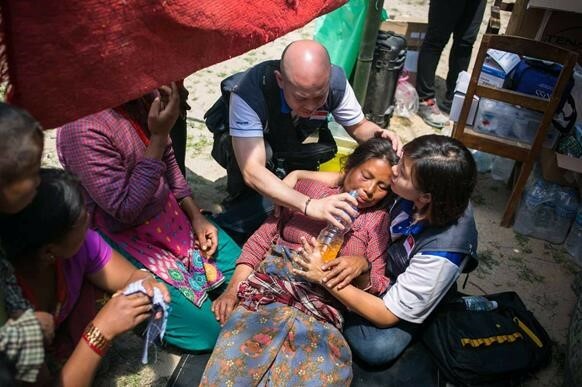 Mercy Relief acted immediately, deploying its first response team within 48 hours of the appeal for help, and by May 12, had conducted 28 relief distribution operations (RDOs) and eight medical missions that benefited more than 20,000 survivors. Work was focused in 10 of the 14 affected districts: Gorkha, Dhading, Sindhupalchok, Kavre, Nuwakot, Kathmandu, Lalitpur, Bhaktapur, Ramechhap and Makwanpur. By the end of May, we had begun preparations for Reconstruction Programme 1, the first step towards restoring lives and livelihoods. For Emergency Relief: Community Development and Relief Agency, HeartBeat, Kathmandu University Dhulikhel Hospital, Kopan Monastery, Rotary Club Kathmandu West and Rural Reconstruction Nepal. For Reconstruction Programme 1: Association of Students of Architecture (Institute of Engineering, Tribhuvan University), Community Development and Relief Agency, HeartBeat, Lakasa-Nepal, Lumanti, Rotary Club Kathmandu West, School Management Committee of Mangala Mai Primary School and Samaj Sewa Youth Club. Transitional Shelter Project: We provided 690 transitional shelters for families in eight districts who had lost their houses, setting up a humanitarian supply chain of construction materials with local partners. The project is valued at S$220,000. School Support Project: Mercy Relief provided 29 transitional classrooms with WASH facilities (toilets and water points), and 1,314 school packs to seven schools in four districts. Local volunteers conducted psychosocial workshops and provided hot meal support to schools in Kathmandu – these were all funded by Mercy Relief. This project is valued at S$50,000. Be part of the solution to challenges faced by vulnerable communities. Collaborate with us and support our humanitarian activities.